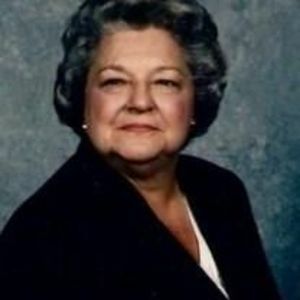 STATESVILLE- Jacquelyn M. Justice, 85, went home to be with the Lord on December 12, 2017. Born on March 7, 1932 in Iredell County, she was the daughter to the late Benjamin and Edna Pennell Miller. Jacquelyn was a long time member of First Baptist Church on Davie Ave. She retired from the Iredell/Statesville School System as the director of Child Nutrition. In addition to her parents she is preceded in death by her son, James D. Justice; two grandsons, Justin Lobeck and Christopher Justice and two sisters, Rebecca Lackey and Selene Holton. She is survived by her daughters, Julia (Bill) Eckliff and Becky Justice; daughter-in-law, Shawn Justice; grandchildren, William (Jenny) Eckliff, Christian Justice and Taryn Justice; two great-grandchildren, Noah and Dylan Eckliff; siblings, Evelyn Hiatt and Benjamin Miller Jr. and many loving family members. A graveside funeral service celebrating Jacquelyn's life will be held on Thursday, December 14, 2017 at 2pm in Oakwood Cemetery with Dr. Jack Causey and Dr. Nelson Granade officiating. In lieu of flowers memorials may be made to Iredell County Hospice and Palliative Care, 2341 Simonton Road Statesville, North Carolina 28625 or First Baptist Church, 815 Davie Ave, Statesville, NC 28677. Bunch-Johnson Funeral Home is honored to be serving the Justice Family.